Aion is a 3D fantasy MMORPG that offers some truly unique experiences to its members. With its wide array of intense character customization options, fantastic combat, and impressive graphics, Aion delivers one of the best free to play options currently on the market. In a world as vast as Aion’s, it is difficult to know where to begin. 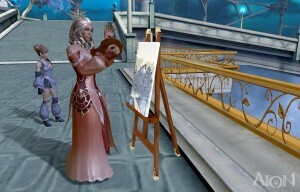 Aion is an incredibly popular MMORPG that has a fierce fan base. It keeps players coming back for more with its large amount of content and beautiful scenery. Also, note that Aion calls itself “truly free” because all of its content is free for all players, meaning there are no free to play restrictions or locked areas. All of its classes, races, quests, updates, expansions, zones, etc. are free. The best gear and items in Aion are found in the game itself and are not buyable in the cash shop. The cash shop mostly sells cosmetic or fun items such as armor skins, furniture, costumes, etc. 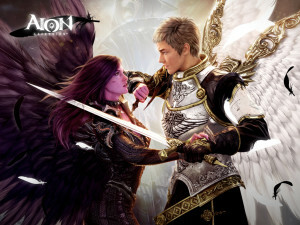 Aion’s developer is NCSoft, one of the most successful MMO companies in the world. They created Guild Wars 1 and 2, Wildstar, Blade & Soul, Lineage 2, and more. Aion truly shines when it comes to character customization. While many others MMOs attempt to add a detailed character creation process and want to give players multiple ways of making their character unique, none of them do it on the scale of Aion. Players can spend hours adjusting the features of their character and building them exactly how they’d like. Some of these features can be overwhelming for new gamers, but it is laid out in such a clean way that it will not take long to figure out. There are four initial classes, but once a character reaches level ten, multiple different sub classes unlock. This offers players an immense way to customize their character and play exactly how they’d like. If a player wants to build a tank, they can easily do so. If, however, they want to play more of a supportive role, that is also available. It just depends on what class and sub classes are chosen. The four main classes are Priest, Warrior, Scout, and Mage. These classes dictate the general style and direction of the character, but there are numerous different sub classes for each core choice. Once a player has chosen their desired class, it is time to build their character. Members are able to choose between two different races, though they are quite similar to one another, in both looks and stats. The Elyos has white wings and are closely related to humans, while the Asmodian have black wings and talons on their hands and feet. It is really up to the player and the style that they would like. Aion does a great job at letting players choose exactly what they want style wise in the beginning, while making sure that these choices do not radically affect the game. 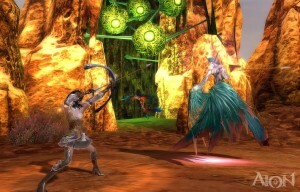 The combat in Aion is unique in a few ways, but it is not radically different from other MMOs. This is perfect for gamers because it adds something new without completely overhauling the system. It is centered on a combo style, so players will be attempting to string together effective and damaging combos to slay enemies. This adds a great amount of strategy to the game and it keeps the battles exciting. Combos must be strung together quick, as there is a time limit on which moves can be used with one another. That means if players strike an enemy with a certain ability, they may only have ten seconds to strike him with their next move to keep the combo going. Otherwise, the combo will stop and they must try again. It is a fun system that really seems to work. In addition to the normal style of fighting, because every Aion character is equipped with wings, there is aerial combat. It is basically the same as ground combat, but certain moves will work better in the sky. One of the most talked about features in the game is the ability of flight. Every character has it and though it can take some getting used to, it is a great addition to the game. Players have a set limit they can fly before they become exhausted and plummet to the ground. This adds a great dynamic to the game. There are both air and ground enemies, so players will have to watch multiple different angles to stay safe. Members are also able to fly from place to place, making traveling through Aion’s world quite fun. While in many games crafting feels as if it was simply added on as an afterthought, Aion seems to be the exception. Crafting is very well thought out and quite fun to do. Players will find a profession that they enjoy and spend hours crafting. There are multiple different crafting options and one of the best things about it is that players can train by using work orders. This way, they do not have to waste their own materials to level up their skills. Crafting will level up the more it is used and the higher the crafting level, the more the player can make. It is a great system that really adds some unique ideas into the game. 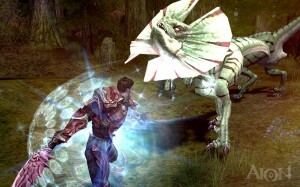 Aion has an intense PVP scene where players can ether duel one another or compete in the large scale battles between opposing factions and alliances. In addition to the other member factions, there is also a faction of NPC creatures that will spawn onto the battlefield, offering unique strategy ideas and combat scenarios. Players will have to worry about other members, while also destroying any of the creatures that come their way. Players enter these battles by heading to the Abyss, but can only do so when they reach level 25. PVP does not actually affect gameplay and players are able to skip it if they wish, at least until the end game mission. The final mission pits multiple players against each other, while also having evil creatures attempting to destroy. It is an end game war to settle it all. Aion may have a few flaws, but they are so minor and easily overlooked that they are barely noticeable. Overall, it is one of the best free to play games on the market and it actually competes with many of the pay to play titles that are out there. For players that want a great customization system, great combat, and a large amount of content, this game surely hits every mark. Thanks for reading this review. If you have any comments or feedback please use the form below. 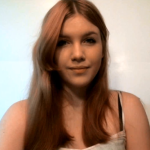 All comments are moderated so it will take 24-48 hours for them to appear publicly.